Project Aether: Aurora leader Ben Longmier stands with a weather balloon payload recovered April 11, 2012, after a snowshoe trek through the Alaska backcountry. FAIRBANKS, Alaska - I paused on the snow-covered Alaskan hillside to catch my breath and pick a route up through the trees. A slight movement at my feet caught my eye; a gray spider was scuttling slowly across the snow. Why was this cold-blooded creature out in the snow, and where was it going? It was a small moment of mystery and magic in a day full of them. I was tromping through the snow with seven other people Wednesday evening (April 11), on our way to retrieve an instrument-laden weather balloon that had fallen to Earth several days earlier. Most of the crew was with Project Aether: Aurora, an expedition that aims to photograph and study Alaska's northern lights from their very edge, about 19 miles (30 kilometers) up. The northern lights blaze in the Alaskan sky in the early morning hours of April 11, 2012, trumping the city lights of nearby Fairbanks (at right). Around 6:15 p.m. local time (10:15 p.m. EDT), we strapped on our snowshoes at the side of a road and plunged into the deep drifts. 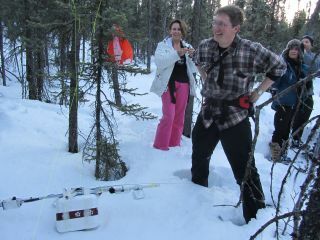 The weather balloon and its scientific payload — including high-definition cameras, a microphone to record the sound of the aurora, bacteria samples to gauge the DNA-damaging potential of cosmic rays and aerogel to catch high-altitude micrometeoroids — lay 0.84 miles (1.4 km) into the forest as the crow flies. But we covered considerably more ground than that, weaving around stunted, skinny trees and powering our way through hip-high drifts. I'd never snowshoed before and found that it can be hard work, especially if you're up front blazing the trail. We passed several clumps of moose droppings but didn't run into the huge animals themselves. This may have been for the best, as moose can be unpredictable and dangerous, especially if you surprise them. We slogged our way through the silent, sparse forest, which began to glow with golden light as the sun sank toward the horizon. Golden light fills the Alaskan air on April 11, 2012, as the sun sinks low in the sky and a snowshoe trek to recover a balloon payload nears its end. About an hour into the hike, it became clear that the fallen balloon lay up a hill of considerable height. This revelation sparked a bit of good-natured cursing and muttering among some of the crew, but we slogged on, climbing up through the thick, untrammelled snow. We finally locked eyes on our quarry a little before 8 p.m. The balloon had come down in a stand of tall trees, but — to our delight and surprise — it sat placidly in the snow, ripe for the plucking. No tree-climbing required. A big grin spread across the face of Project Aether: Aurora leader Ben Longmier, a physicist at the University of Houston and chief research scientist at Ad Astra Rocket Co. This evening's find marked six recoveries out of 15 balloon launches to date. "[I'm] pretty excited," Longmier said. "You know, we trekked for about an hour and a half, and it's just really rewarding to finally come across the payload." We let out a few celebratory whoops, then tucked into some beef jerky and granola bars to fuel up for the journey back to the cars. The return trip was more of a stroll than a slog, as we'd beaten a fairly sizable trail into the snow. But my progress was slowed by frequent gawking, as the sun's descent had filled the valley we'd trudged through with a soft but spectacular golden glow that begged to be stared at, and photographed. We made it back the cars at about 9 p.m., just as the sun was sinking behind a distant mountain and the suffusing gold began to shift to the cold gray-blue of dusk. Dinner in Fairbanks — about a 30-minute drive away — would taste good tonight.